i run 0 overclocks, all stock. I have even downclocked core by -100 and ram by -300. Running at 190w (around 76% TDP), the problem persists. Just for shytes and giggles, I went ahead and ran MTP on CD and it faulted and reboot within a few minutes. I ran TT Miner for 12 hours, same settings and it didn't reboot, however I got several refused shares due to the difficulty not being high enough supposedly. 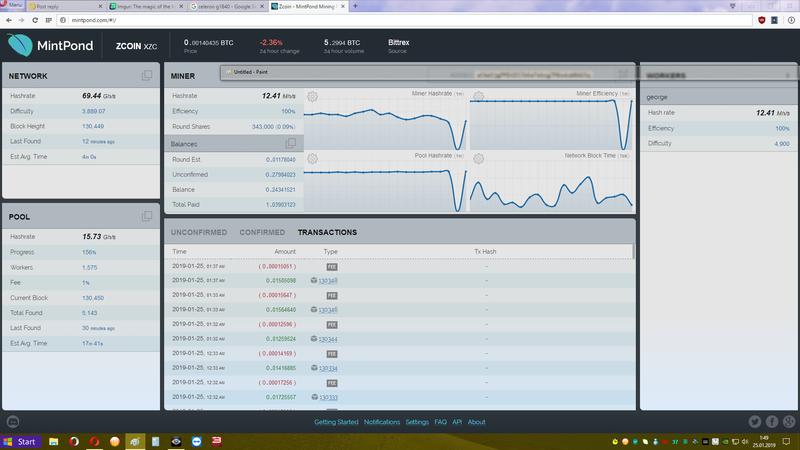 I ran CC Miner and it also didn't have a reboot, although I did find I ended up with several refused shares as well. I ran these tests on a 4 card rig, 2x 1080s and 2x 1080tis. I was also using pill and a slight OC +125 Core / +100 Mem on the ti's and +100 / +100 on the 1080s. None of the voltage was changed. 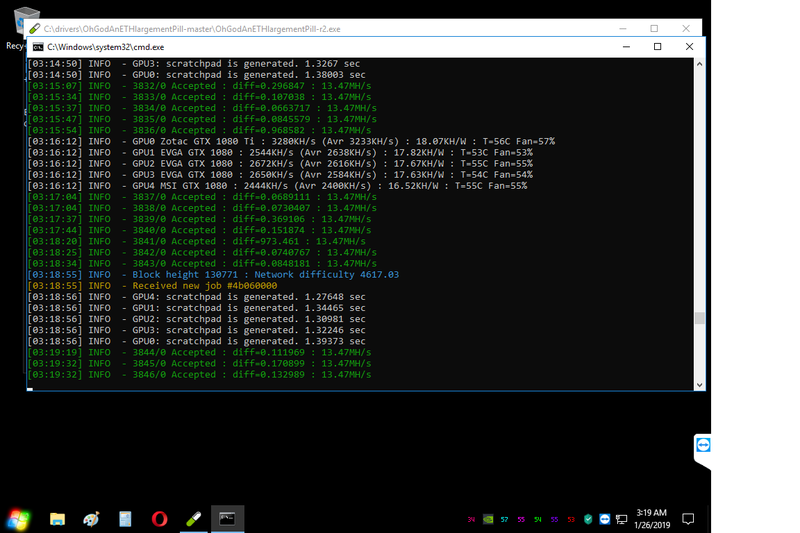 i'm newbie in mining, but i tested CD on 1080s *1080ti-s, no crashes/reboot (only problem i faced was fluctuating Kh/s) and that was bc i used intensity 8, and the highest recommended intensity is 6.
did u upgrade ur driver to 417.71? r u using Cuda 10? r u using lastest CD 0.16.1 ? did u change any settings on Nvidia control panel? did u use the recommended virtual memory by the developer ? All valid questions! I'm not a newbie and have been mining longer than I should (according to my wife). Drivers are updated. Cuda 10 running. Latest version of CD. Control panel settings are standard mining settings, including performance over quality. I have 8GB physical mem and over 100gb of virtual mem over 4 SSD cards on that rig. Sometimes (not everytime), while the tree is being created, the clock jumps up in a matter of a second. If your overclock isn't stable enough and can't handle such spikes (or your PSU), your rig will crash. Open Afterburner or similar and make sure these jumps will not exeed 2050 core on your 1080 Ti. The 1080 you have to test by your own, my are fine with 2050 and some with 2100. You can test your settings with CCMiner, it will crash here way faster than CD. If all is rock stable, switch back to CD and enjoy more $. Edit: And dont split your virtual memory. Only use one SSD, not 4. My core never exceeds 1810 on my ti's - great tip to watch for though. Hadn't heard or even had an issue with each drive having a page file... I'll condense to one to see if I gain anything. Thanks for that tip! I went ahead and DDU'd my drivers as well as uninstalled Visual Studio. I reinstalled the drivers, CUDA 10, VS kept my clocking the same and used pill. I've been running for a couple hours with a *slight* hashrate increase (somewhere around 4% which I won't sneeze at) and it hasn't faulted yet. I'll run her this way until tomorrow just to test it down. I'll post stats tomorrow. Try also without the pill. It makes no difference with CD (-i 8 ), but can make a rig much more stable. CD tops out with -i 6 though... ? At least that's what the readme says... Do you set CPU priority or leave it at 3? I always use only -i 8 on all rigs, thats all. No CPU affi or anything else. But it seems the new intensitys are close to each other. Well, it crashed around 3am. I was running pill and will stop that for today's testing. George, you get 13.6 Mh/s for one 1080ti? If true, that is more than I am getting for 2x 1080ti & 2x 1080s... presently I'm at about 12.7 Mh/s for all 4 cards running. I'd love to hear the rest of your setup, including any of your nvidia settings. It occured to me... I think you mean to say you're getting 13.5 KH/W - not KH/s - KH/W refers to power consumption vs your hashing - your actual speed is shown on KH/s. and i'm about the same except i'm getting a litte more due to max oc (electricity not issue for me). Thanks for the clarification. I hadn't seen the previous post. Those cards are leftovers from my old gaming rig and each has a waterblock that I installed. #2 has +100 / +100 with 100% power, no voltage increase - #3 has +100 / 0 with 100% power, no voltage increase. I noticed when I try to OC mem on #3 it gets frizzy so I left it alone. The 1080s are FE's - forgot to mention that. 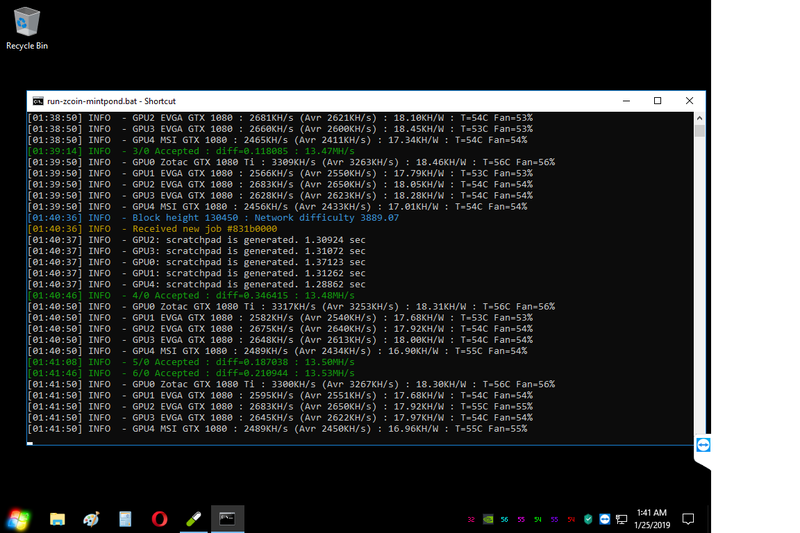 Without a waterblock, getting 58c while mining is *stellar* in my experience, especially considering the OC you have on it. I'd be very happy with those temps.